I'm a freelance journalist and public relations consultant specialising in arts and entertainment. The Opera Bar at the forecourt of Sydney's Opera House is the perfect venue to take overseas visitors to. 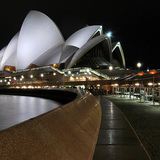 The venue offers superb 360 degree views, with Sydney Harbour in front and the Opera House behind. It's a great location to have Friday night drinks at, a pre-performance beverage or late night supper after a movie at the Opera Quays or a production at the iconic Opera House. Impromptu singers and DJs often perform there such as La Fiesta Sound System, which provides a fun experience to listen to funky tunes whilst hearing the backing track of waves lapping on the harbour foreshore whilst sitting under the stars. Special events include the Melbourne Cup Day and Opera Bar's Disco Wonderland New Years Eve party which you need to pre-book for. The drinks menu is high end with an extensive list of champagne, wines and cocktails. Make sure you take a jacket as it can get chilly that close to the water, wear a sparkly number and have some fun.